49, of Barboursville, West Virginia, died August 2 in Kuwait in a non-combat-related incident while deployed in support of combat operations. He was assigned to the 130th Airlift Wing at McLaughlin Air National Guard Base, West Virginia. An Air National Guardsman from West Virginia was killed in a non-combat-related incident in Kuwait Aug. 2. The Pentagon on Thursday identified Tech. Sgt. 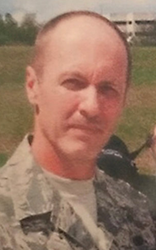 David Board, 49, of Barboursville, West Virginia, as the service member who died. The release did not say what caused his death. Board was serving as an aircraft fuels systems craftsman. Board was assigned to the 130th Airlift Wing at McLaughlin Air National Guard Base in West Virginia, and was supporting Operation Inherent Resolve at the time of his death. Board enlisted in the Air Force in 1986 and was a veteran of operations Desert Shield and Desert Storm, the West Virginia Department of Military Affairs and Public Safety said in an email Thursday. He served 14 years in all — six years on active duty as a missile maintenance specialist, and eight years with the 130th’s maintenance squadron. He received the Air Force Achievement Medal, Air Force Commendation Medal, the Global War on Terrorism Service Medal, the National Defense Service Medal, the Antarctica Service Medal, and the Air Force Good Conduct Medal.